So, I wonder. I marvel. I nervously anticipate said encroachment (I'm sure the perfume and music industries know exactly what I'm talking about). 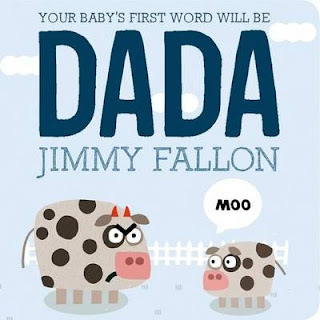 Happily, in the case of The Tonight Show host and funny man Fallon, Dada has indeed pulled through with a dry, succinct and funny tale showcasing a series of animal dads intent on securing that all-elusive first word--'dada'. Science tells us that 'dada' does indeed come first (apparently over 90 per cent of English-speaking babies have this predilection) but it's with much delight, in this adorable book, that each animal shuns 'dada' in favour of hee-haw, quack, oink, ribbit, peep, and other onomatopoeic delights. The resultant look on the face of each animal dad is subsequently priceless. This book is a simple concept, done well, with nice production values, warm humour and gorgeous illustrations. It's a shame illustrator Miguel Ordó­­ñez hasn't been given cover credit for his work. I'm well aware of the sales pull of celebrity monikers on books, but Miguel really does deserve cover space, as ALL illustrators (ie: equal creators who often do a greater amount of the heavy-lifting) do. A gorgeous book for littlies and a case of celebrity done well.